The SafeType ergonomic keyboard is the first keyboard that solves the problems of pronation, dorsal flexion and ulnar deviation that occur while working on a conventional keyboard. The SafeType ergonomic keyboard is the only keyboard that can place the user in a position that is completely Orthopedically Neutral while doing data entry and cannot be adjusted improperly by the user. It provides unsurpassed comfort. The SafeType is the only keyboard demonstrated in a Major University Study to virtually eliminate the high-stress postures that contribute to Repetitive Stress Injuries, such as Carpal Tunnel Syndrome. If you stand with your arms relaxed at your sides, and use only the biceps to bring your hands up and forward until your forearms are parallel to the floor, you are now in the most relaxed typing position possible, with your palms facing each other. That is the position you are in when typing with the SafeType ergonomic keyboard. SafeType� ergonomic keyboards were designed according to scientific Biomechanical Principles, not simply modified from old flat keyboard designs. It's the Science of Biomechanics at work for you! The SafeType is the first keyboard that solves the problems of pronation, dorsal flexion and ulnar deviation that occur while working on a conventional keyboard. 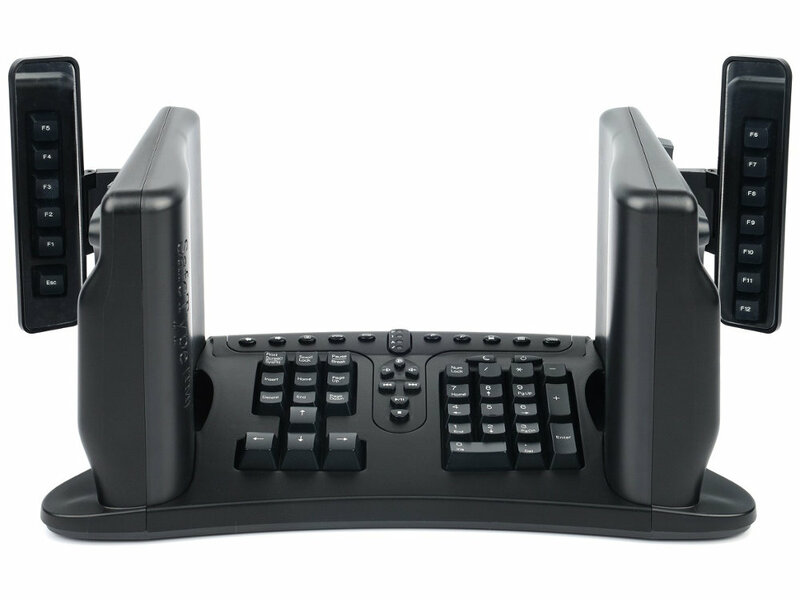 No drivers needed: The SafeType ergonomic keyboard is simply 'plug and play' on Windows Vista, Windows 7, Windows 8 and Windows 10 operating systems, so no installation of any drivers or software is required. If you are still using Windows XP the keyboard will work fine, but you won't be able to use the extra shortcut keys in the middle section. In some cases these extra keys won't work with Windows 10, but these keys aren't needed for normal use of the keyboard. Space bar: Customers who bought a SafeType many years ago, might recall it had two space bars, one on either side. Many customers where complaining that the back space key is a bit far to reach, and because of that the left side space bar was assigned the function of an additional back space key in later models. This is still the case.